Supermarkets – Are they currently cheaper than Chemist Warehouse or Pharmacy Online? When I was writing this, I wondered whether Australian Supermarkets are as cheap as they might have us believe. To examine this, I decided to select a list of items that would traditionally be regarded as pharmacy, but, are now sold both in Supermarkets and pharmacies. I picked Chemist Warehouse and Pharmacy online as I feel that they are price competitive and they appear to have up-to-date prices for their stock online. For my research, I walked through various Woolworths, Coles and Chemist Warehouse stores in SE Melbourne. I have outlined the prices and I challenge readers to see if their stores are cheaper than Chemist Warehouse or if my figures are wrong. Deep Heat® seems to be cheaper at Coles and Woolworths than in the two pharmacies. Sudafed® was more expensive at Coles than the other three. Compared a 20 pack in Coles/Woolworths with a 24 pack in Chemist warehouse/Pharmacy Online. Every week, certain products are cheaper as they on special at Coles and Woolworths. 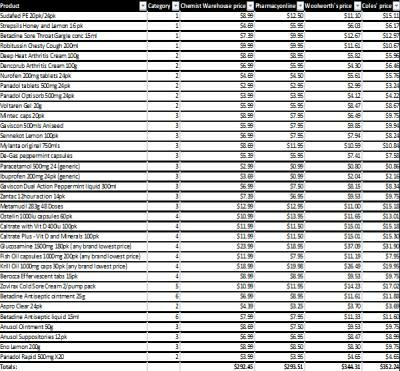 In this analysis, I studied the prices on one day 29/11/12 and the prices quoted could vary when they are on special. Ostelin® seemed to be consistently cheaper in Woolworths and in the weeks before 29/11/12, it was on special for $8.99 for a 60pack. I couldn’t find a generic Paracetamol/Ibuprofen home brand for Chemist Warehouse. Many Pharmacy Discounters appear to me to be obsessed with brands. The standard of the aisles in Woolworths and Coles was impeccable. In contrast, the three Chemist Warehouse stores that I visited seemed much more untidy (in my biased view) in comparison with little facing up of products. 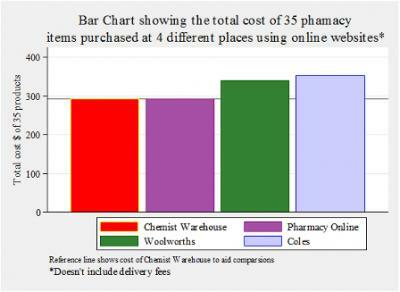 The two Pharmacies (Discount) appeared to be 15-18% cheaper than Coles and Woolworths as illustrated by my figures. To get a better comparison, more products need to be compared, but my figures might be of comfort to the many pharmacies that have come to think of themselves as charging too much for their goods and services. You could also suggest that Coles and Woolworths are not quite as cheap as they might have you believe. Maybe, Chemist Warehouse has more buying power for these items than Coles or Woolworths has at the moment in this area? Maybe, generic margins on prescriptions are helping to cross-subsidize cheaper prices on OTC products at the pharmacies? From the results of walking many stores, if Woolworths and Westfarmers were allowed to run pharmacies, then I believe that they would run different models to cater for the heterogeneous needs of a wide population of patients. Supermarkets are convenient for patients- maybe even more convenient than most pharmacies are for the majority of customers currently? It’s easy to stock up on Painkillers, vitamins and indigestion medicines as you stroll from aisle to aisle. I feel that the prices might reflect this in Coles and Woolworths. In the event of deregulation, I believe that Coles and Woolworths might run a convenient pharmacy model with better service levels. Places like Big W and Kmart might run bigger and cheaper Chemists with a focus on having the cheapest prices. You are better selling 20 items a day making $5 profit each (total profit = $100) than selling 40 items making $2 profit each (total profit = $80). It’s more complicated than this, but hopefully this simplistic example illustrates why I think that convenience might be a determining factor to the prices of the 35 items in Woolworths and Coles. I think that pharmacy owners are possibly panicking at the moment (with Price disclosure promising to cut pharmacy prescription margins to below cost) and those who think that providing their goods at the cheapest prices should not be the only option might take heart from my findings. If a pharmacy is conveniently located for patients, then, that pharmacy may not need to charge the lowest prices. If discounting leads to a reduction in service levels, then certain populations of people (e.g. Elderly) will not like this and the lower service level could be detrimental for them and potentially leading to higher overall healthcare costs. Many people place other issues higher than sale price such as location and service. Not all pharmacies should be “Aldi’s” such as some Discounter Chemists appear to be. Maybe, it’s okay for some of us to be “Coles” or “Woolworths” with our price offer to patient at least. I don’t know if pharmacy will be deregulated before 2020. My gut feeling is that Woolworths and Coles are not ready just yet. It’s a momentous task tied to creating changes in both Federal and State legislature and only those without inside knowledge of the industry would assume that it can be suddenly done within 2-3 years. It’s an area built on trust and getting it wrong could have disastrous consequences for your brand. As an employee pharmacist, all I really care about is that my customers get the best service from me and I work in an environment that provides career prospects and fulfilment. I have had these during my pharmacy career with Pharmacy Owners. If you have a good idea, it’s easy to have it applied and that is very rewarding. I don’t know if the same applies at Woolworths and Westfarmers. I have talked to employees of both companies and I think that for them, there are advantages and disadvantages to working for big corporates.